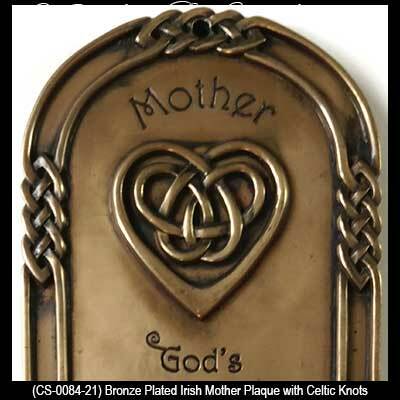 Irish mother's blessing plaque features a bronze plated finish along with a Celtic knot border and it is enhanced with a knot-work heart. "God's most precious work of art is the warmth and love of a mother's heart". 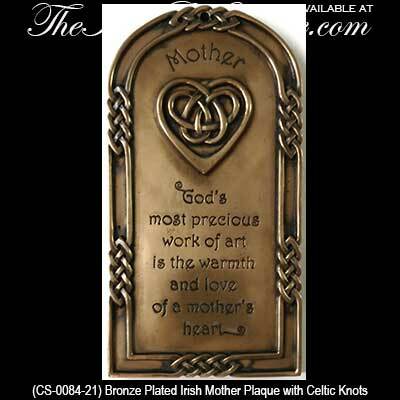 The Irish blessing plaque is a tribute for mother and it is surrounded with Celtic knots and it includes an embossed knot-work heart. 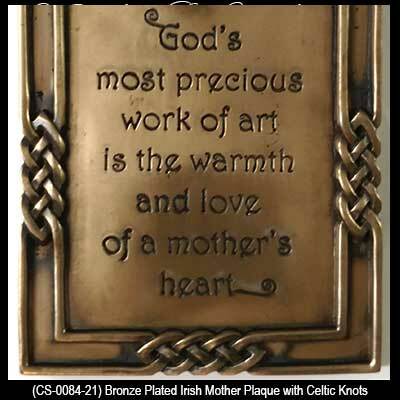 Made of hand crafted, cold cast bronze plated construction, this Irish mother's blessing plaque measures 4" wide x 7 3/4" high x 1/2" deep and has a dimensional design that is ready to hang on your wall. This Irish blessing plaque is made in Ireland by Celtic Shadows and it is gift boxed with a Celtic knot history card, complements of The Irish Gift House.